I'm rating this a 5 because the consistency is perfect; thick enough but not too much so that if one wanted to make a meatsauce out of it, the spoon would not stand up straight in the middle of the pot. Also a 5 star for ease of preparation and ingredients one tends to have on hand. I did have to add 2 more cloves of garlic but I am a garlic lover. 1 clove just did not seem to do it justice. I followed exactly and used a 'Mier's Winecellar white table wine'. I added the 1/2 cup and it was not overpowering. I love to cook w/wines but don't drink it and although I could taste it, it wasn't overpowering. It seemed to enhance the flavor and didn't hinder it. It also is a sweeter sort of wine so thought it would help with that sauce tartness thing we all try to fix. I did have to add 1 Tbsp. of BROWN sugar and that took care of it. 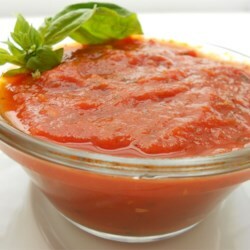 **I recently saw on Food Network that if you use BROWN sugar in any redsauce, it helps with that tartness fix better than white. ** Thanks for the great recipe. I'm going to let it sit in fridge overnight and make eggplant parm. tomorrow.